The guys get together to recap Andrew’s on-sight reporting of the Rice game. We also voice our grievances with Charlie Weis and ask whether he really is the guy to lead this program to the next level. We close with some basketball recruiting talk, including Cliff Alexander and JaQuan Lyle. Come on in, have a beer, and enjoy the Jayhawk Talk Podcast. If you like what you hear, please subscribe on iTunes and give us a rating/review on iTunes. The guys get together to talk about the UNDEFEATED JAYHAWKS!!! We talk through some KU football news, reflect on fat guy touchdowns, recap the whole KU-SD game, and preview the Rice game. Come on in, grab a beer, and enjoy some time with the Jayhawk Talk Podcast. It is now September. We are only days from the beginning of football season. And with football season comes tailgating. You probably think your tailgate is awesome. You’re probably right because all tailgates are generally awesome. However, I’m here to help you try to make it even more awesome this season. 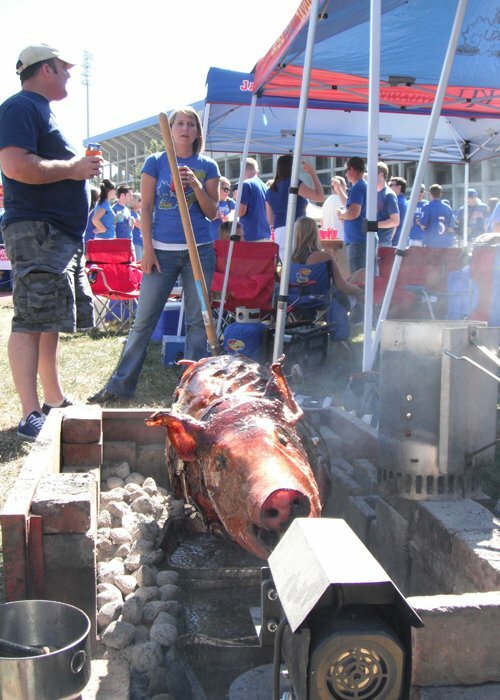 At the University of Kansas, we have to make the best of our unique tailgating situation. Finding your spot is the first key to a successful tailgating season. I’m a proponent of always tailgating in the same spot, so find that special place and make it your own. It’s good to have familiar surroundings on Game Day, and your buddies will always be able to find you. Also, if you have too many adult beverages, you always know where to stumble back to find your ride home. Now that you have your spot on lock, let’s talk supplies. If you want to look like a boss (who am I kidding you want to look like a boss) get team-themed gear for your tailgate. If you already have gear and it’s not team themed, no sweat; just get some of those Jayhawk stickers and put them on your cooler. The more Jayhawks, the better. People need to know. Having a portable grill is crucial to the success of any tailgate. If you don’t own a portable grill, the end of summer is a good time to buy one as grills will be going on sale everywhere at the end of August/early September. Coleman and Weber each make portable propane grills for under $200. Both are perfect for your tailgating experience. I suggest propane over charcoal because you don’t want to wait 20 minutes for the coals to get hot. On the same note, ALWAYS have an extra propane bottle, because no one wants to eat raw food. However, if you’re a college student (or anyone) on a budget, charcoal grills are cheaper, so go with what suits you best. Having a folding table is also a good idea. Give yourself some space to set up and lay all your food and gear out. Otherwise you’ll always be rooting around in the back of your car to find things. Being prepared for weather conditions is also key. 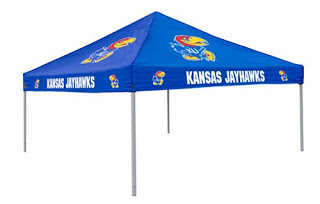 As the Jayhawk Talk tailgating crew found out last year against Oklahoma State on “Get wet with Weis” day, having a tent could be very beneficial (we didn’t). This season we opted for a tent. No more raining on our parade. But if you’re tough and badass and don’t care about a little rain, you can do without. Now that we have our spot and our gear, it’s time to talk food and beverage. In this regard, preparation is critical. I recommend procuring all your necessary items before the day of the game, especially if it’s an early kick off. Nothing says amateur hour like showing up late because you had to run to Hy-Vee. Planning ahead will also provide you the opportunity to do some prep work in the kitchen instead of a back yard. This is especially handy if you need to cut stuff up or need to do something ahead of time like brown meat so all you need to do is reheat it. Sometimes have a theme for your tailgate like “Bloody Mary’s and Bacon.” What? Themes are cool! Make something unconventional for your main course (We made pizzas last year and it was awesome). Have extra food. Running out of stuff is lame. If you have too much, share. People will like you for it. Have options, not everyone likes the same things. Side note: Please do not have a theme for a tailgate like ‘Kegs and Eggs’ if you will not being having both kegs and eggs. Make the same food every week. Share with opposing fans. Tell those losers where to go (Hell). Forget to turn off your grill. That’s how fires start. Beermosas- Like a mimosa, just replace champagne with beer (trust me, it’s good). Obviously this list is not exhaustive, but it should get you well on your way to impressing your friends this season with your tailgating skills. Just don’t be the guy who only shows up with one tiny deal of macaroni salad. No one likes that guy. Kevin and Andrew are BACK for the real KU football preview podcast. The DEFINITIVE KU football preview podcast. The ONLY KU football preview podcast made by KU fans in existence on the entire internet, at least that we know of (we haven’t looked). We talk recap of 2012 (briefly) and get into 2013 newcomers, schedule and season preview, and why both of us accidentally picked us to make it to bowl eligibility. We are then joined by Rustin to talk some Over/Unders, position battles, and expectations for the season. Come on in, grab a beer, and enjoy the 27th episode of the Jayhawk Talk Podcast. ROCK CHALK. Find us on iTunes HERE (pretty much any device except Droid platform phones). Find us on Podbean HERE (non-iPhone users). Editor’s Note: The following comes to you from a good buddy of mine and JHT Contributor, @TheLachmanTest. Give him a follow on Twitter for some solid KU Football discussion. It was a cool December night when a few friends and I exited Milan Puskar Stadium, with John Denver’s “Take Me Home, Country Roads” still ringing in our ears. The kind hill folk of Morgantown thanked us for visiting and apologized for the lopsided scoreboard. 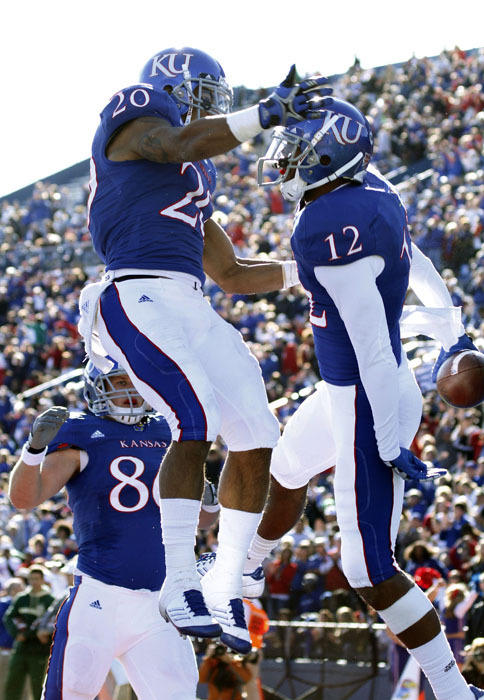 The 2012 KU football season was finally at an end. Nine months after that night, we’re finally a few days away from the start of the 2013 season. A lot has changed since last year: a new QB, new uniforms, an influx of JUCO talent, and a new defensive scheme are all part of the excitement as we get ready for the new season. Year 1 of the Weis era involved 6 close losses. If 2 or 3 of those had gone our way, fans, media members and prognosticators would all have a different view on the upcoming season. Arguably, KU has upgraded several positions including QB, WR, DL, the secondary, and perhaps most importantly, kicker. 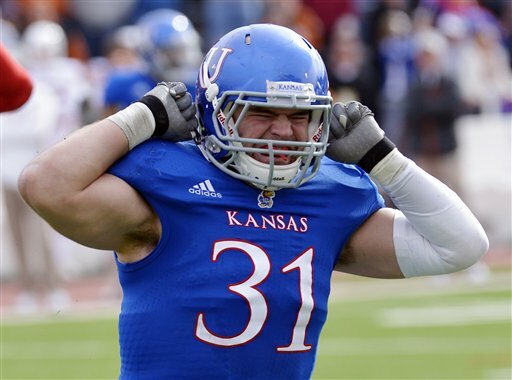 Add a second season under S&C coach Scott Holsopple, and I feel KU is ready for a big jump in Year 2. Here is my take at a season long prediction, as a way to get warmed up for September 7th. 1) These predictions won’t be objective or unbiased; I am a KU fan, after all. At the same time, I’m not going to predict a Big XII or national championship either. I mean, what are the odds of that happening? 2) I had most of the following written up a little while ago, so the Addendum will contain a few notes following the games on opening weekend. Sept 7th vs. South Dakota: I wasn’t even going to bother looking up any information on the Coyotes, but curiosity won out. They have a couple of bad things in common with KU: They finished last in their conference last year, going winless in their league, and are predicted to finish last this year as well. No matter, this better be a tune-up game where the result isn’t in question after the first quarter. Addendum: I’m sure the KU coaching staff will emphasize KSU and ISU’s losses to FCS teams over the weekend to make sure the team doesn’t take the win for granted. The Coyotes, meanwhile, won a 10-7 showdown against UC Davis. Sept 14th @ Rice: We all remember last year where KU missed a couple of field goals, Dayne Crist threw a late interception, and the Owls kicked a field goal to pull out the win. This year, they have most of their team back, including a senior QB, while KU travels to Houston for the first road game of the year. This will be a tough road test. Rice gets two weeks to prepare following their opening week game against #JFF, and they’ll be ready. 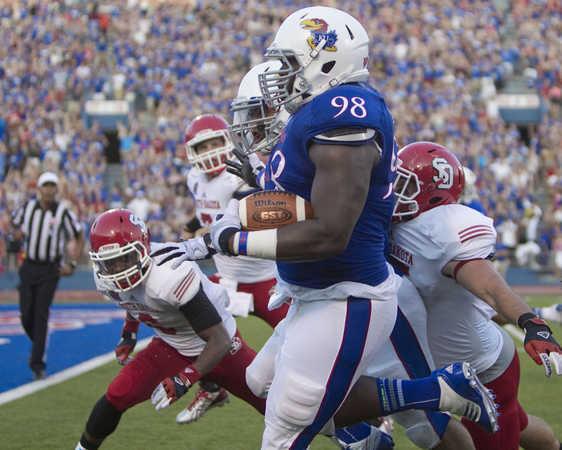 Having said that, KU still has a chance to pull off its first road win since the 2009 season. The result of this game will impact the rest of the season. Addendum: The Owls’ offense looked dynamic, at least in the first half. No idea if their defense has improved because A&M is going to put up points on almost every team they play. Rice showed enough to make me really uneasy about this game. Here is hoping Rice did “this” against A&M, and comes down to earth in a couple of weeks. Sept 21st vs. La Tech: The Bulldogs had a pretty good year last year, finishing at 9-3. But what followed was a series of unfortunate events. It started with declining a bowl bid (that’s right), losing their head coach to Cal-Berkeley, and an exodus of talented seniors, leaving at most 7 returning starters. The cherry on top: In comes Skip Holtz, recently fired from USF. I think they are in for a big rebuilding year which is good news for KU. Addendum: La Tech lost on the road to NC State, while committing several turnovers and playing at a slightly slower pace than last year’s breakneck offense. 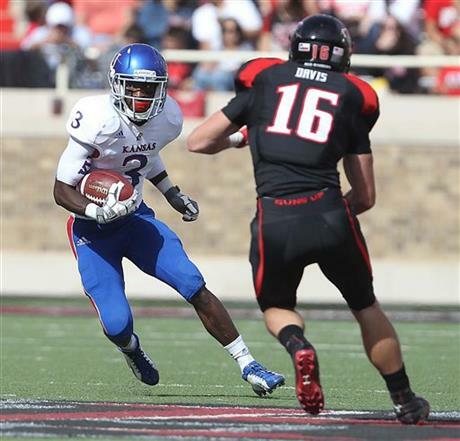 Oct 5th vs. Texas Tech: Last year, KU took Tech to double OT, while almost exclusively running option plays on offense. This year, Tech’s prodigal son returns home as former QB Kliff Kingsbury takes over as head coach. His most recent achievement is coaching up #JFF last year as A&M’s offensive coordinator. He believes in playing without thinking and not issuing playbooks. We’ll soon find out if that particular approach works. 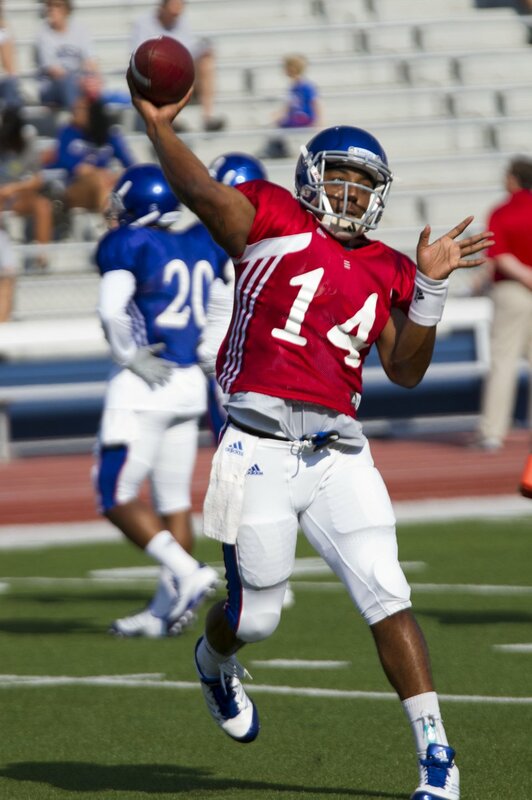 Tech’s biggest question is who will play QB, which is good news for KU. How does it end? Tech sleep walks into its first Big XII road game under Kingsbury, KU is rested and prepared after a bye week, and the crowd is fired up for Homecoming. Enough to give us a fighting chance to pull off a squeaker. Addendum: Tech started a true freshmen walk-on QB and rolled SMU on the road. So much for uncertainty at the QB position. I still think KU’s change in defensive scheme, along with Weis’ plan of keeping KU’s offense at a slower pace to keep the other teams’ fast paced offenses on the sidelines will give us a chance. Also, Tech’s defense is still AWOL, not seen since prior to the Mike Leach days. Oct 12th @ TCU: TCU was a young team last year, and kept getting better as the year went on. Last year KU kept it close with an opportunistic defense, but turnovers and poor special teams play led to a loss. This year I expect TCU to challenge for the league title. Looking at the schedule, TCU has road trips to Norman and Stillwater with the KU game sandwiched in between. Can KU catch them looking ahead? KU will keep it close, but will fall on the wrong side of the scoreboard. Addendum: TCU lost to LSU on Saturday night. There is no shame in losing to the Madhatter and the ultra talented tigers. TCU showed a lot of speed/athleticism on the field, and unveiled their 2 QB system. No change in my prediction, but the slight chance for an upset special still looms. Oct 19th vs. OU: Last year, this game marked Michael Cummings’ first start, which quickly turned into rotating QBs between him and Crist. It didn’t go well, and the game was a blowout. I really don’t have anything else to say about that game. Fast forward to this year, OU plays Notre Dame, TCU, and Texas 3 weeks in a row prior to arriving in Lawrence. How healthy are they going to be after that 3 week stretch? How hungry are they going to be to win in Lawrence after 3 straight “national spotlight” games? Either they are going to be on a serious roll and brush KU aside, or beat up and tired enough to keep KU in the ball game. I think KU keeps it closer than last year but gets out matched at the end. Addendum: Trevor Knight looks like another true dual-threat at QB, and the defense posted a shutout against UL-Monroe. Nice way to start the season. Oct 26th vs. Baylor: KU hung around for a half last year, and then our WRs’ season-long case of the “dropsies” went from severe to life-threatening. Heck, two years ago, even ol’ Turner had RGIII and Co. down 21 points going into the 4th quarter (until an epic collapse and OT loss). 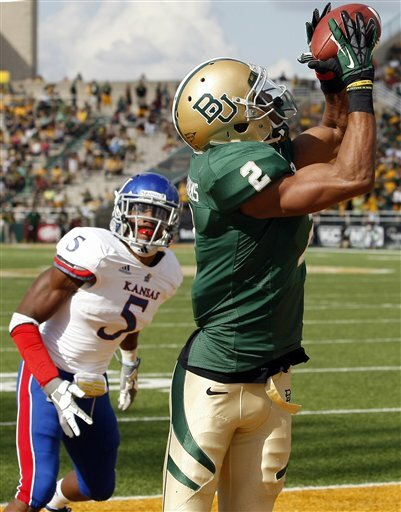 This Baylor team should come into Lawrence at 6-0; however, this will only be their second road game of the year. Their schedule is back-loaded starting with a home game against OU after the KU game. Will they get caught looking ahead? Can they handle the cool, crisp late October weather in Kansas? How much Jayhawk Kool-Aid have I ingested at this point? All I’m saying is that we have a chance to pull this off. Addendum: Baylor beat up on Wofford 69-3, which doesn’t really tell us much. Essentially, they were padding stats on both sides of the ball, which will help their season averages. Nov 2nd @ Texas: KU was so close to pulling out the win last year, it almost makes me sick enough to regurgitate some of that Jayhawk Kool-Aid I just had. Almost everyone is expecting big things out of Mack Brown’s crew this year, but I’m not. I expect them to have an 8-9 win season, with a close home win over KU as one of them. Side note: As this, the last year of the BCS, how about a quick look back at the classic Texas/BCS rant? I miss that guy. Addendum: Texas started slow, but eventually rolled New Mexico State, as expected. If they can win at BYU and beat Ole Miss, the national championship chatter will only get louder. Nov 9th @ OSU: For the few of us who stuck around after the extended rain delay last year, this was our first glimpse of hope that, just maybe, Weis can turn things around. You could see the team fighting on each play. Unfortunately, this year’s OSU team is better than last year and the game is in Stillwater. I don’t see it going our way this year. If you want to feel better, we can blame Tyler Patmon for giving them a thorough scouting report. Addendum: OSU looked solid beating a mid-level SEC team at a neutral site. 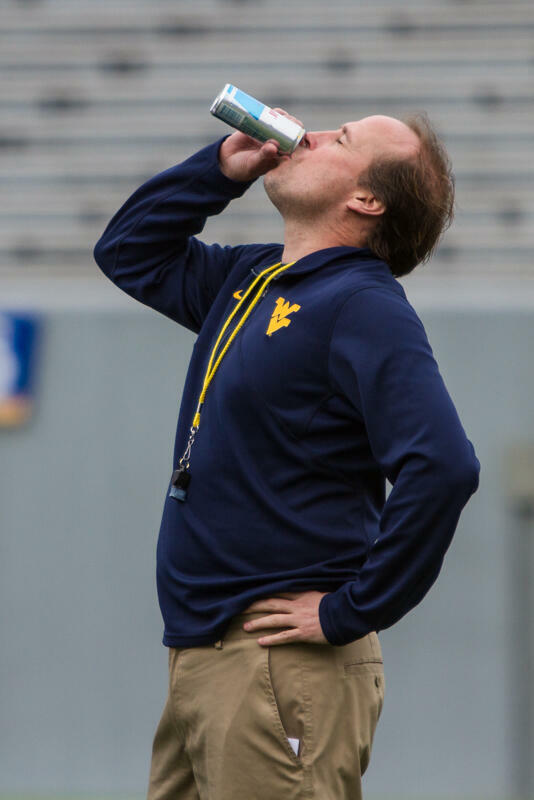 Nov 16th vs. WV: Dana and his sugar-free Red Bulls come to Lawrence for the first time. I have a feeling West Virginia is in for a long and bad season. What would you expect after a team loses a recording setting QB (Geno Smith), game breaking playmaker (Tavon Austin) and best receiver (Stedman Bailey) to the NFL, along with a few other guys who ran out of eligibility? Those guys beat up on us pretty good last year, but by the time they get to Lawrence this year, there isn’t going to be much of a fight left in that team. Addendum: The Mountaineers came from behind to pull off a win against the Tribe of William & Mary. Who knew William & Mary had a football team or that they’re called the Tribe? Nov 23rd @ ISU: These guys always play tough and they always have a card up their sleeve. For example, breaking out their 3rd string QB against us last year, on their way to blowing us out on our senior night. This is our best chance to win a Big XII road game since the 2007 season. It will be their senior night, a good time to get some revenge. Nov 30th vs. KSU: Just like WV, I think the Wildcats are also in for a bad year. Yes, they are always under-rated; yes, they are the defending league champs, but this is not last year’s team. Collin Klein graduated and the defense lost a majority of their starters. We know Snyder finds gems in recruiting, but let’s face it, this isn’t ‘Bama, where the next draft pick is waiting in the wings. This will be KU’s senior night, and we’ll send the seniors out in classic fashion. Bonus Prediction #1: KU breaks out the all black uniforms for this one. Well, there you have it: 4 wins, 4 toss-ups and 4 losses. Can we lose to Texas Tech and ISU? Of course we can. Can we dig deep to pull off the Rice and Baylor games? I think we can. I’ll split the difference with a prediction of 6-6 and a bowl bid. With a program like KU, you would expect most starters to be in their 3rd to 5th year in school — guys who have developed through the strength and conditioning program and have some playing experience. For 2013, these would be the recruits from the classes of 2009 up to 2013. 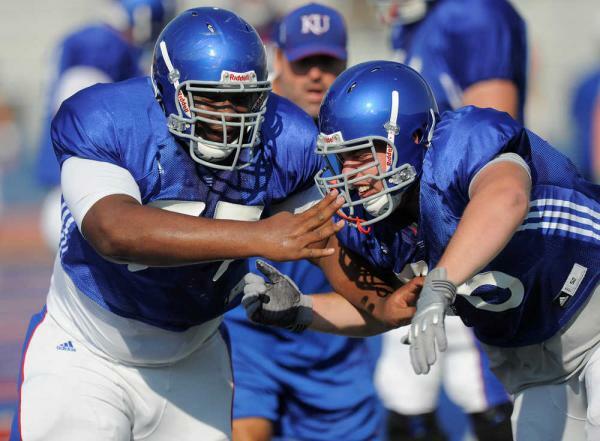 The 2009 class were true freshmen during Mangino’s last season. The 2010 class was a mix of Mangino/Gill guys. 2011 were all Gill guys. 2012 were a mix of Gill/Weis guys. 2013 was all Weis guys. While putting this lineup together, I was not surprised how Charlie Weis has revamped the roster and has a lot of his guys starting or fighting for a starter’s spot. I was surprised to see Mark Mangino still having an impact on the roster and on the flip side the lack of impact by Turner Gill. On second thought, I’m not surprised by the lack of Gill guys in the lineup given the complete lack of discipline, accountability, and an overall lackadaisical attitude under his charge. To come up with lineup, I used the spring depth chart, various articles and quotes along with some educated guesses to come up with a starting lineup. I used Jayhawk Slant to gather commitment dates and other recruiting information. Let’s take a look the potential starting lineup. Starters are in BOLD. QB: Jake Heaps: a BYU transfer brought in by Weis. This year we will go only as far as “The Mormon Cannon” will carry us. His backup is Michael Cummings, a Gill recruit. I was part of the #freemichaelcummings campaign last year, so it saddens me to say I only see him being used as part of running/option package. RB: James Sims: committed to Dave Beaty on 7/13/09 under Mangino. Ran for over 1,000 yards in only 9 games, with most defenses knowing that we are running the ball 9 out of 10 plays. I’m excited for his senior campaign. Taylor Cox is JUCO transfer brought in by Coach Weis, and will be a great change of pace backup. RB/WR: Tony Pierson: He committed to Reggie Mitchell under Gill. No question, the best player on the field. We should all expect big time plays from this guy all season long. WR: Andrew Turzilli: Turzilli has all the physical tools to be a standout at WR, showing some flashes last year. He committed to Dave Beaty under Mangino. His backup is most likely Christian Matthews, who is versatile enough to play QB in the “Jayhawk” formation. During the spring game, he also filled in at CB for a couple of plays. Matthews committed to Dave Beaty on 6/20/08. WR: Justin McCay: McCay is a transfer from OU brought in by Weis, and is another guy with good physical tools to play the position. Tre Parmalee is a Weis recruit who saw decent playing time as a true freshman last year, and he’ll play the slot position. All other WRs who could see playing time are recent transfers (thus all Weis guys). TE: Jimmay Mundine: Mundine showed flashes of his full potential and the expectations are even higher this year. He committed on 7/31/09 under Mangino. His backups are a JUCO transfer, Charles Brooks, and a redshirt freshman, Jordan Shelley-Smith, both Weis recruits. LT: Pat Lewandowski: From the sound of it, there is a 3-way battle. Lewandowski may have the upper hand over Riley Spencer and Zach Fondal. He is a local kid who committed to KU in January 2010 under Gill. Weis & Co. converted him from a DE to LT. Riley Spencer committed in Jan 2009 under Mangino. Fondal is a JUCO transfer brought in by Weis this year. LG: Ngalu Fusimalohi: Penciled to start is Fusimalohi who is a JUCO transfer under Weis. Damon Martin is a Gill recruit, most likely the backup. C: Dylan Admire: Another battle for the starting spot, Admire is penciled in as the starter for now, over Mike Smithburg and Gavin Howard. Admire is a local kid who committed to Reggie Mitchell under Gill. Smithburg is a JUCO transfer under Weis, Howard is a Mangino commitment. RG: Randall Dent / Mike Smithburg: Tough call between these two. Smithburg is an incoming JUCO transfer, who has been on campus for winter conditioning and spring ball, while Randall Dent played a lot last year but could end up splitting time with Smithburg. He originally committed to Dave Beaty under Mangino. RT: Aslam Sterling: Sterling is a JUCO transfer brought in by Weis last year. He has dropped weight and gotten in better shape and is a lock for the starting spot. Brian Beckmann, who committed to Reggie Mitchell under Gill, should be the backup. With the offensive line we’re looking at 2 Weis guys (Fusimalohi & Sterling). Then there are 2 players connected to Gill — one of whom was recruited by Reggie Mitchell (Admire), the other a converted defensive end. Randall Dent will be the one starter recruited by Mangino. If Fondal (left tackle) and/or Smithburg (center) get the starting nod, Gill gets credit for only one starter on the entire offensive side of the ball. LE/T: Jordan Tavai / Tendarian Johnson: Both are JUCO transfers under Weis. Tavai should be the starter as he was here last year, and held up okay while under a steep learning curve. Johnson arrived in time for spring ball and should get to see the field this fall. NT: Marquel Combs/ Ty McKinney/ Tyler Holmes: Combs is the #1 rated JUCO recruit in the country this year, and penciled in as a starter. Mckinney was supposed to be a JUCO transfer last year, but academic issues pushed it back to this year. Both are Weis recruits. Holmes is a redshirt freshman, who was being recruited by Buddy Wyatt under Gill and finally committed in Jan 2012 under Weis. RE/T: Keon Stowers/ Keba Agostinho / Kevin Young: Stowers is a JUCO transfer under Weis, and should be the starter. Agostinho is a Gill recruit under Buddy Wyatt, while Kevin Young is a holdover from the Mangino days. BUCK: Chris “Robin Hood” Martin/ Andrew Bolton/ Ben Goodman / Michael Reynolds: Bolton is a JUCO transfer this year under Weis who also had SEC offers. I would guess his athleticism lends him some playing time. Goodman was recruited by Buddy Wyatt under Gill, and has continued to improve every year, really coming on late last year. Reynolds is also a Gill recruit, and should be a situational pass rusher. The D-Line was a big focus for Weis and Co., and they have definitely built depth at that position. No matter the starters, I expect a lot of rotation to keep fresh legs in the game. OLB: Courtney Arnick / Marcus Jenkins-Moore: Arnick is a redshirt freshman who committed under Weis; Jenkins-Moore is a JUCO transfer, who arrived on campus in June 2013. At this time it is a toss-up who will start. MLB: Ben Heeney: Heeney should/will be the starter. Recruited by Gill, he earned 2nd team All Big 12 as a sophomore starter last year. His backup will be Darrius Willis who followed Gill from Buffalo, redshirted and then had to prove himself again to Weis to stay on this team. OLB: Jake Love / Samson Faifili: Recruited by Gill and Co., Love played a lot as a redshirt freshman last year, and should be the incumbent starter. Faifili is a JUCO transfer who should be on campus as of June 2013. He’ll compete for playing time at either of the OLB positions, similar to Jenkins-Moore. CB: Dexter McDonald/ JaCory Shepherd: McDonald is a local kid who committed to Reggie Mitchell under Gill. After leaving the team for one year, he was brought back by Weis. Shepherd was recruited as a wide receiver under Gill but was converted to DB by Weis & Co. I would say whichever guy does not start will be the nickel cornerback. SS: Isaiah Johnson: Johnson is a JUCO transfer and brings considerable hype with him. He should be on campus at the start of July, and is penciled in as a starter. Tevin Shaw is a redshirt freshman who committed under Weis and will get a chance to prove himself. Ray Mitchell, while listed on the spring depth chart, is not listed on the official roster on the KU athletics website. FS: Dexter Linton / Greg Allen / Kevin Short: Linton committed to Dave Beaty under Mangino, and brings the most experience as a senior. Allen is a redshirt freshman who committed under Weis, while Kevin Short is a JUCO transfer, who may see time all over the defensive backfield. CB: Cassius Sendish / Nas Moore / Tyree Williams: Sendish is a JUCO guy who has been here for spring practice and should be a starter. Backups may include Moore, a JUCO transfer last year or Tyree Williams, a redshirt freshman. All are Weis guys. It is a little harder to break down the defense since more positions are up for grabs, but there are at least 6 Weis guys (LE, NT, RE, OLB, SS, CB); at least 2 Gill guys (MLB, CB); 1 Mangino guy (FS) and tossups between Weis and Gill guys at the BUCK and other OLB position. Let’s assign one to each. K/P: Trevor Pardula: The spring depth chart has Pardula, a JUCO transfer, listed as a starter at both positions. Eric Kahn, a transfer from Mid America Nazarene may also get a shot at being the kicker. Both of those guys were brought in under Weis. Either way, Ron Doherty has good competition at both positions. Snapper: Zachary Young / Reilly Jeffers: Young is a transfer from Indiana. Jeffers played as a freshman last year. Both are Weis Guys. Not surprisingly, Turner Gill recruits have zero impact on special teams. Reggie Mitchell and Buddy Wyatt: There is a reason Weis only kept these two from the prior staff. Almost all the Gill guys on the list above are linked to those 2 guys. They may have been the only 2 coaches on staff who knew what to look for in a potential recruit. Dave Beaty: His name came up a lot as well. The dude could and can recruit. I wish Weis would’ve kept him. Instead he’s at Texas A&M as an assistant coach & recruiting coordinator. A&M’s 2012 recruiting class was ranked: #15 in the country. 2013: #11, 2014: #6 and rising. Sigh. Well, for one thing, Turner robbed us blind. For his $10 million, we’re getting maybe 4 starters on this year’s team, when it should be close to half. During his opening statements he said a lot of things, which were essentially just a lot of hot air and B.S (by the way, be careful reading that transcript, it may induce excessive eye rolling and possibly vomiting). Gill pretty much did the opposite of what he promised, running a loose program with no discipline or accountability. There is a reason Weis had to kick out nearly a third of the team, and that is also the reason he has had to bring in so many JUCO guys, players with experience and physical development, to fill in all the gaps. Having said all that, I think Weis has us on the right track, with a potential bowl season in 2013. Is the “Wildcat” here to stay? 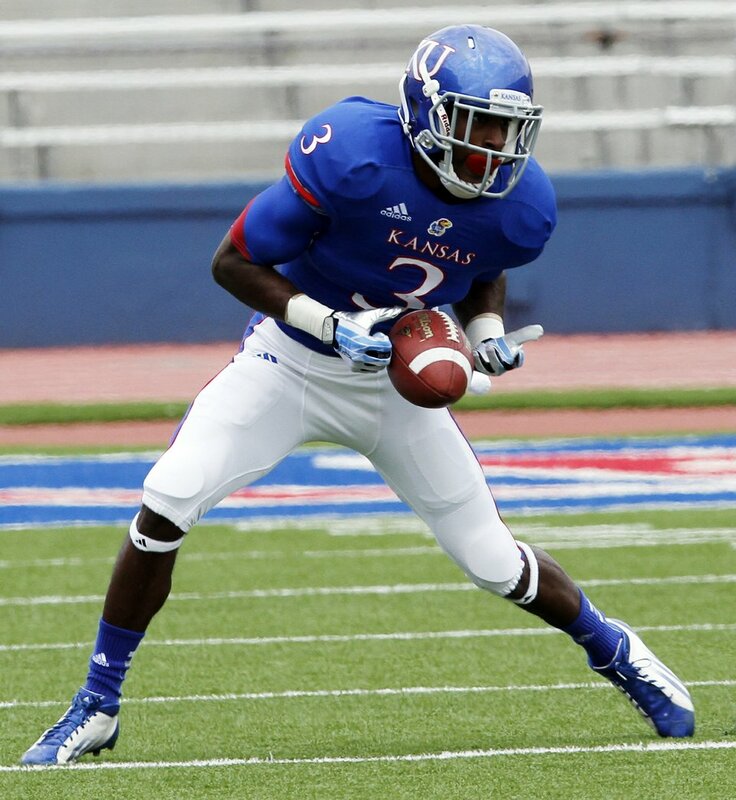 On last week’s Jayhawk Talk Podcast, we made the argument that KU’s best wide receiver may be our running back, Tony Pierson. On this week’s podcast, we argued that KU’s best wide receiver might instead be our quarterback, Dayne Crist. I’m referring of course to the “Wildcat” formation package (some prefer to call it the “Jayhawk” formation) that Charlie Weis featured for a number of snaps in the Northern Illinois game last Saturday. The package was designed for Christian Matthews, a dual-threat quarterback turned wide receiver turned… quarterback. Matthews had not been able to find the field much as a wide receiver, but that might change now that he has potentially found his niche. 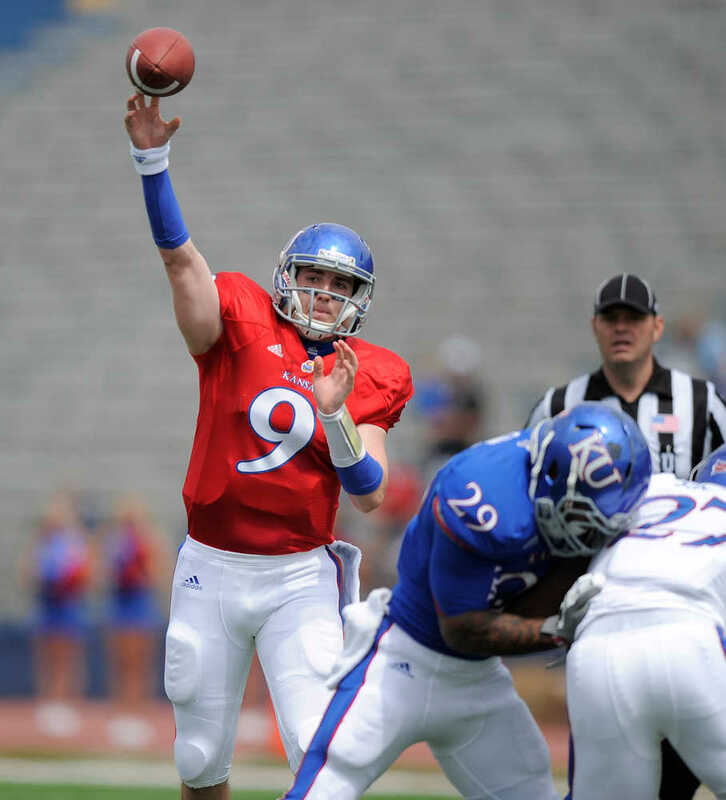 Recruited by Mangino back in 2009 (which seems like ages ago in KU football years), Matthews was at one time a talented high school quarterback that threw the ball for 5,042 yards his junior and senior seasons. That two-year span included a 44-16 TD:INT ratio and a completion percentage of 65%. Let’s all reflect for a moment how nice it would be to have a 65% completion percentage from KU’s quarterback position. Traditionally, the Wildcat/Jayhawk formation works best when it is used as an element of surprise. Say you’re a defender and the opposing team breaks huddle with 10 seconds left on the play clock. You’re a safety that was about ready to stack the box against the run. Next thing you know, the offense sends its star quarterback (with a laser rocket arm) all the way out wide. You are forced to quickly adjust the defense because the secondary must now account for the quarterback as a wide receiver. It’s now 10 on 10 instead of 11 on 10. For the most part, KU ran this package with the above-referenced personnel on the field. Unfortunately, the element of surprise was not all that strong since Matthews rarely sees the field as a wide receiver. In the future, savvy defenses will know that if Matthews checks in, the Wildcat will be coming. Not that it changes a whole lot. After all, defense is built on simple math. You always want to have one more guy than the offense can block. But when you face the Wildcat, that advantage is lost because the cornerback must give the quarterback spread out wide a cursory look – at least until the play has started. By then, hopefully, it will have been too late. Matthews looked very good running the Wildcat offense. He made great reads of the defense and for the most part chose the correct option. He carried the ball five times himself for 43 yards. One thing he did not really do is pass the ball. And if Weis is going to keep this package around beyond the NIU game (which he definitely should), the threat of a pass must be there to keep the defense honest. As referenced above, Matthews has been a competent quarterback at one time in his career. The next step in employing a true Wildcat package is to threaten a pass occasionally. If it’s not there, tuck it and run. The threat is all that is needed. The NIU game was the first game I’ve really been able to follow real-time reaction on Twitter, since there’s not really any service at Memorial Stadium. Every indication was that KU fans loved this new offensive wrinkle. Perhaps because it was actually effective! We moved the ball well throughout the second and third quarters when the Wildcat was loose. And then, just like that, it was caged again. Should Cummings be running the Wildcat over Matthews? Weis turned back to a more traditional offense throughout the 4th quarter because NIU began to stretch the perimeter of their defense. While I understand his reasoning, I disagree with it. A good read by the Wildcat quarterback will negate that adjustment by sending a few HB dives at the defense. After all, KU has the personnel to make them pay for it. After a few of those, hit the fake HB dive and play action it to Ragone. Who cares if you miss? It sets up the sweep once again and you’re back to where you started. It sure beats 3 straight passing attempts and a punt. With Crist in the game, do not concern yourself with game planning for any downfield threat. Single coverage will always suffice. Instead, focus solely on stacking the box against a very competent running game. Mix in a lot of blitzing because, again, your secondary will be fine (See #1). By the 4th quarter, rotate in as many blitz packages as you have on the Rolodex. By this point, the offensive line will be toast and you’ll be able to blow up most runs before they get started. And, if you’re lucky, perhaps Weis will have transitioned into calling every 7-step drop passing play he can find in his own Rolodex. It will turn into a sack party. Rinse and repeat. I should be clear. The Wildcat does not cure these deficiencies. And I’m not arguing KU should go to a full-on Wildcat formation offense. What the Wildcat does do is force defenses to read and react instead of just barreling downfield at the quarterback every play. It allows more offensive playmakers to be on the field at the same time. It is easier for our O-Line to block. It opens up the potential for some trick plays later in the game (or in future games). Hell, if Pick is on the field, you have three competent QBs who could pass the ball to somebody. More than anything, KU demonstrated that the Wildcat can be effective, which is more than we can say for the traditional offensive sets Weis has been throwing out there. My last point on the Wildcat/Jayhawk is this: Does anyone else find it interesting Weis chose Christian Matthews to run it and not Michael Cummings? As many of you may know, Cummings is listed #2 on the depth chart and was recruited to KU just the same as Matthews as a dual-threat quarterback. He has every bit of the running ability as Matthews, but with a much, much better arm. Personally, I think Weis is scared to death to see Cummings enter the game and outshine his golden boy. You think there is quarterback controversy now… imagine if Cummings was given a package and just killed it? We’d be looking at Jason Swanson over Barmann. At Reesing over Meier. Cummings over Crist? 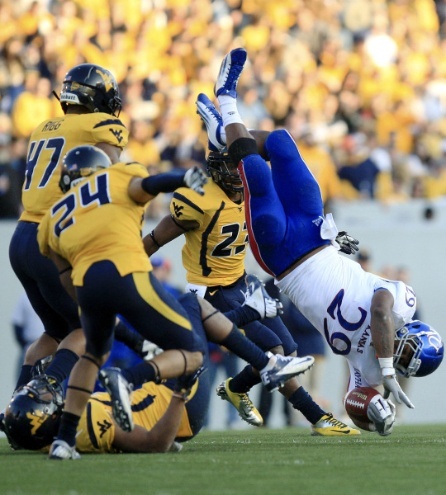 Unfortunately, barring injury, we’ll never know who really is the better option for these 2013 Jayhawks. For now, let’s at least hope the Wildcat is here to stay. It was better than many expected. 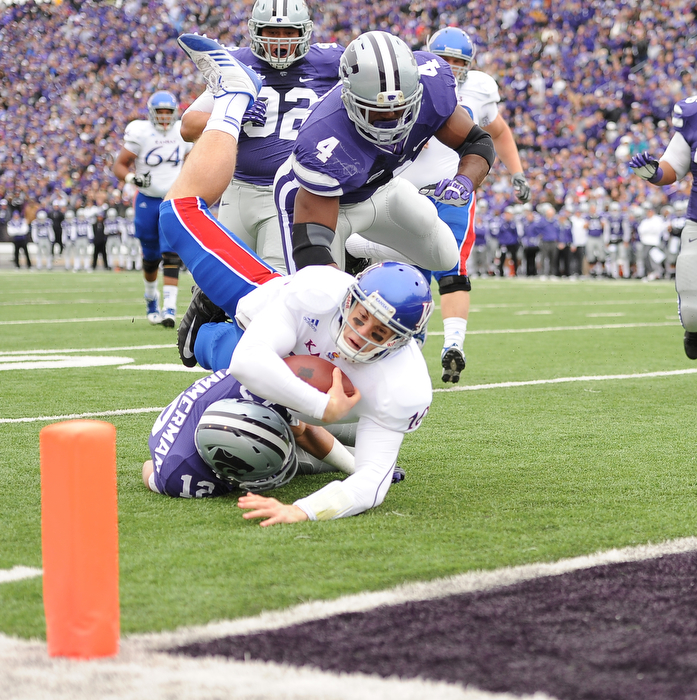 After such a devastating loss last weekend to Rice, Kansas looked much improved in many facets of the game. Unfortunately, the offense could not capitalize on the opportunities the defense gave them throughout the game. It was one of those games that Kansas certainly could have won had the offense been able to finish drives. It could also have been a 30 point loss had TCU taken better care of the football. I’m not sure how much we learned about the team other than it was sure nice to see the players compete their butts off for 60 minutes. This was not always the case last season. 6 – Number of receptions Tony Pierson caught. I have argued for the first two weeks that Weis was crazy to not try to get him involved in the passing game. It was so good to see him succeed in this role, and I am hopeful it is only the beginning. With James Sims returning next week, I’d like to see both of them on the field at the same time, with Pierson lined up in the slot. 12 – Number of KU turnovers forced in 2012. For some comparison, KU only forced 18 turnovers all of last year. Now if we could just get the offense to score some points off those turnovers. 37 – Doherty’s new range. He made one over 30 yards! I should note he also kicked a field goal from 37 yards last year too, so he matched his career long. His range is established, Charlie. Don’t test it. 13.0 - Average yards per kick return in 2012. Good for 4th worst in all of FBS football. We have got to get better in this department. 12 – Tackles by McDougald on the game. He had 9 solo tackles and two forced fumbles as well. Unfortunately he was a little lost in coverage a few times, but overall had a solid game. 3:58 – Amount of time KU had the ball in the 4th Q. Tough to mount a comeback when the other team has the ball the entire quarter. One KU 4th Quarter drive lasted 23 seconds (3 straight passes and out). 25% – KU 3rd Down conversion percentage in 2012. Bottom 5 in all of FBS football in this department. For a team that has a good offensive line and running game, this number should be much higher. Perhaps the development of Pierson on a quick toss will help raise this percentage. 20.3 – KU average points per game in 2012. For some comparison, Oklahoma State is averaging 62.3 points per game, West Virginia 55.5, Baylor 55.3. The second worst in the Big 12 is Iowa State at 28.7. Seven of the ten Big 12 teams average 46 points or more per game. 100 – Receiving yards for Turzilli on 3 receptions. Loved seeing Turzilli get involved in the passing game. Provides a big target for Crist. Could have had many more yards had he pulled in a couple catchable balls. 2 – KU running backs in the top 5 of the Big 12 in rushing yards. Impressive that both Pierson and Cox are among top 5 backs in the Big 12. The addition of Sims may cut into Cox’s carries, but he has proven to be a great all-around back when called upon. Best stiff-arm since Jon Cornish. 48.7 – Crist completion percentage against TCU – He went downfield much more in this game, which contributed to this percentage. His receivers also dropped a few very catchable passes. However, it still isn’t pretty. He had quite a few opportunities to check down after going through his progression and he failed to do so. Hopefully he’ll start to rely on the underneath route a little more, which should help open some things up. Note: We’re very excited to be going forward on the Jayhawk Talk podcast. Follow me at @JayhawkTalk on Twitter for more information. The first episode should be up on the website and iTunes this week! Yikes. I argued that we didn’t learn a whole lot about this Kansas team the South Dakota State game. The competition was not very fierce, and it was easy to chalk up a few defensive gaffes and some juiced throws to nerves and rust that accompany many openers. We learned much more about KU on Saturday. Crist was the easiest target for blame on a day where there was a lot of it to go around. He lacked focus and precision. He seemed flustered and rushed at times when he did not need to be. He looked capable in the first half, connecting on a few nice out patterns and a post or two in the middle of the field. But it did not take long for the Rice coaching staff to discover that KU has absolutely ZERO downfield threats. And with that, came the blitzes. The running game, which literally carried us to a victory in the first game, became strained once it was apparent that the receivers were irrelevant. And the two-score lead which KU built on a nice drive to start the second half dissipated with every missed opportunity (read: field goal). The blitzes will continue. So will the 8 (or 9) men in the box. Weis will need to show a little more creativity than he showed on Saturday to be anywhere near competitive against TCU. Despite the poor tackling in some circumstances, I was not overly disappointed with the defense. Rice scored 24 points against UCLA in the first game. If you told me before the game that we would give up 25, I would have taken it. There’s no excuse for missing open-field tackles, but I get the feeling last year’s defense would have given up 40 to Rice. You might recall that defense. You know, the 120th ranked defense in the nation. Now, for some more numbers. 12 – Rice’s road game losing streak. Rice snapped its long road losing streak, which dated back to a September 11, 2010 32-31 victory at North Texas. If you’re curious, Kansas will look to break its own 13-game road losing streak this season, which dates back to a 34-7 win at UTEP on September 12, 2009. 8 – The number of Rice defenders in the box on nearly every 2nd half play. Crist, Weis, and the wide receiver corps (sans the injured Kale Pick) made defense very simple in the second half. Rice had the option of either (a) blitzing the hell out of KU off the edge, or (b) stuffing the box with 8 defenders. KU was forced into a one-dimensional offense that could no longer rely on the run and play-action. It worked. 2 – The number of 100+ yard rushing games for Tony Pierson in 2012. TP rushed the ball 19 times for 120 yards, good for a 6.3 yard average. His partner in crime, Taylor Cox, also pitched in 15 carries for 79 yards (and a TD), good for a 5.3 yard average. Hopefully these two can continue their success against TCU. It will likely depend on Weis and Crist’s ability to make the ‘Frogs defense at least halfway respect our passing game. (Note: I’m still waiting to see Pierson in the slot to get him some action in the passing game). 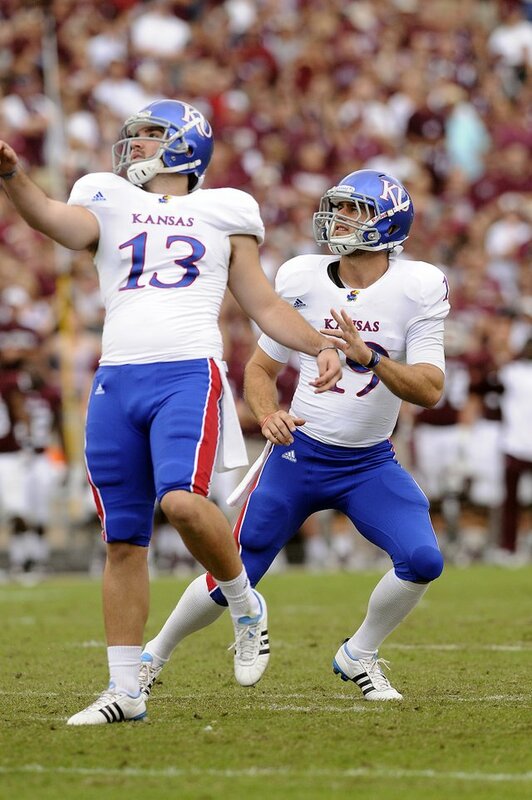 29 yards or less – The distance KU should attempt field goals the rest of the season. Ron Doherty is now 2 for 5 on the season, with makes from 22 and 29 yards. For every kick beyond 30 yards, it has not been pretty. On a more cheerful note, he is a phenomenal punter (8 punts on the season for an average of 46.9 yards). 10 – The amount of yards our defensive backs were playing off Rice receivers all game. This is one aspect of the game that was so infuriating to watch from the stands. Rice knew it. Kansas knew it. We all knew it. The underneath routes and hitch routes were open the entire game. And Rice was smart enough to take advantage of it. It isn’t all a lack of horses at corner. Campo clearly doesn’t have much faith in our linebacking corps in pass coverage either. 1.5 – The Over-Under on the amount of wins KU will have this season. I’m taking the over, but barely. I think we’ll sneak a win somewhere we don’t deserve, similar to a Georgia Tech in 2010. You might remember that win came directly after a devastating 6-3 loss at home to North Dakota State. Not terribly unlike a devastating 25-24 loss to Rice. Perhaps TCU is in trouble? 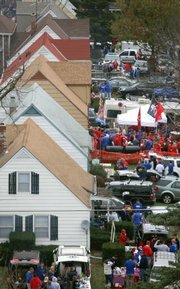 I know the picture painted above is somewhat bleak, but hang in there, KU fans. We knew his was a rebuilding season. It’s not going to change overnight. I just hope we see a little more creativity out of our coaching staff going forward. After all, we don’t ask for much as KU fans. One thing we do ask is to not be embarrassed. Let’s start Saturday. It wasn’t exactly pretty. But it was a win. And around here, we’ll take those most days. After all, it wasn’t that long ago that a guy named Turner lost his first game as KU’s head coach to a directional Dakota school. So this was a good start. And I think most can agree with that. I’ll have more analysis throughout the week leading up to the Rice game. The point of this post is to provide a few numbers from the game and analyze how they impacted the final score. It will be a recurring post throughout the season to help paint the bigger picture before re-watching the game film for more in-depth analysis. 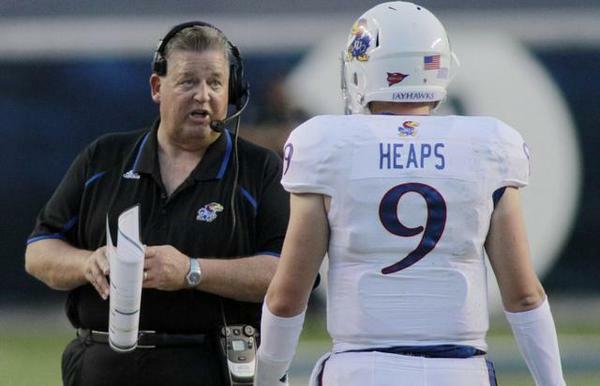 (1-0) – Charlie Weis’ record at KU. You can’t win them all unless you win the first one. Congratulations to Coach Weis and his staff on #1. Hope it is one of many during his tenure in Lawrence. (30%) – KU’s efficiency on 3rd/4th down. Kansas actually moved the ball pretty well on Saturday. The team just had some difficulty finishing drives. This number helped contribute to that. Against better teams, we will need to improve our short yardage third down conversions. (4.7) – Crist’s yards per pass average. For only completing 47% of your passes, you would think the yards per average would be higher. You would especially think so after watching the first play (43 yard bomb). It was a forgettable game for Dayne. I expect this number to be higher in every future game Crist plays under center at Kansas. (99) – We don’t need to go into this one. Blah. (7.6 and 6.2) – Yards per rush for Taylor Cox and Tony Pierson, respectively. Each ended up with 100+ yards rushing on the day. Incredible effort by both guys and good blocking up front as well. It will be interesting to see what the breakdown is among all the talented RBs once Sims returns. (11-21-09) – The last time Toben Opurum played offense. He ran as the lead block on Pierson’s red zone touchdown run. Looking forward to seeing him in this capacity more this year. (2) – The number of interceptions Bradley McDougald pulled in. It is the first time a KU defender has had two in the same game since Darrell Stuckey did so against Missouri on 11/28/08. It was also two of the four overall interceptions the team pulled in. (2) – The number of blocked punts KU registered in the game. 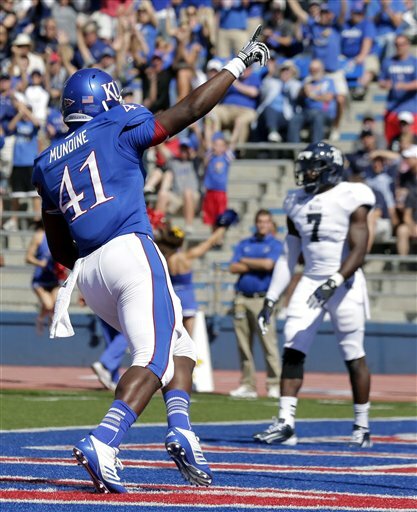 It was the first time KU has blocked multiple punts in a game since 10/23/04 against Oklahoma. (0.0 and 27.3) – The average kick return yardage for KU and SDST, respectively. This will have to be an area of practice this week. Our kickoff coverage was not great. It will be interesting to see if Weis puts a few more starters on this unit. We’re also going to have to find a way to get a touchback once in a while. 573-569-58 – The overall record of the KU football team. KU will need to win a few games this year to keep this record from entering the red. More analysis to follow in coming days and weeks. Looking forward to watching this team grow throughout the year.